How important is Emotional Intelligence for leaders? You be the judge. A very unscientific poll that I conducted on social media recently asked participants to think of a leader that they admire and then to identify attributes of the leader that make them admire the leader or want to follow them. When we tabulated the results, after we merged similar attributes such as ‘kind’ with ‘compassionate’, and ‘brave’ with ‘courageous’, we were left with 51 identified attributes. Admired Leaders were described as Caring, Empathetic, Engaging, and Inclusive. People said that the leaders that they would follow were good Communicators and that they had Integrity. Mostly, the leaders were Courageous, Honest, Compassionate, and Visionary. All of these characteristics are associated with people who are high in emotional intelligence. All but three of the characteristics mentioned were functions of Emotional Intelligence. Three of the characteristics were better associated with Intelligence or Technical Skill than with Emotional Intelligence. 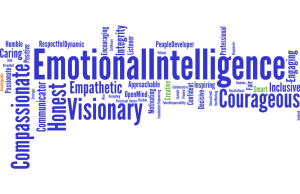 48 of the 51 attributes that made people admire or want to follow a leader were associated with emotional intelligence. Clearly, we want emotionally intelligent leaders. It matters now, more than ever. Back in the day of command and control, when your boss told you what to do, unless the task was immoral or illegal (and maybe even then), you did it because you wanted your job. Many a modern leader has been heard to lament “I’m their boss. I give them a paycheck and they are supposed to do what I say. Why isn’t it working?” Oh, don’t we pine for the good old days. Modern leaders need to use influence, rather than authority, to motivate people. They need to lead by example and inspire people. Leaders need to connect with people and communicate confidently and empathetically, with authenticity and transparency. Stay calm in the storm, by allowing you to sense your emotions before they overwhelm you. Remain open-minded long enough to get all of the facts in order to devise better and more durable solutions. Connect with people in a way that makes them want to work with you, support you, even buy from you. Prevent something you will regret later, by providing the insight to focus on your objectives rather than your immediate impulses. Allow you to recognize and acknowledge your developmental opportunities before they derail you. Speak up with courage and compassion when something important needs to be said that no one else is saying. Operate with integrity when another path is easier. Stay focused under pressure and find the motivation to stay on point to push through difficult tasks. Meet challenge with agility; respond to set-backs with flexibility and tenacity.